Polish rabbi; born at Cracow in 1680; died at Offenbach Jan. 16, 1756. On his mother's side he was a grandson of Joshua of Cracow, the author of "Maginne Shelomoh." 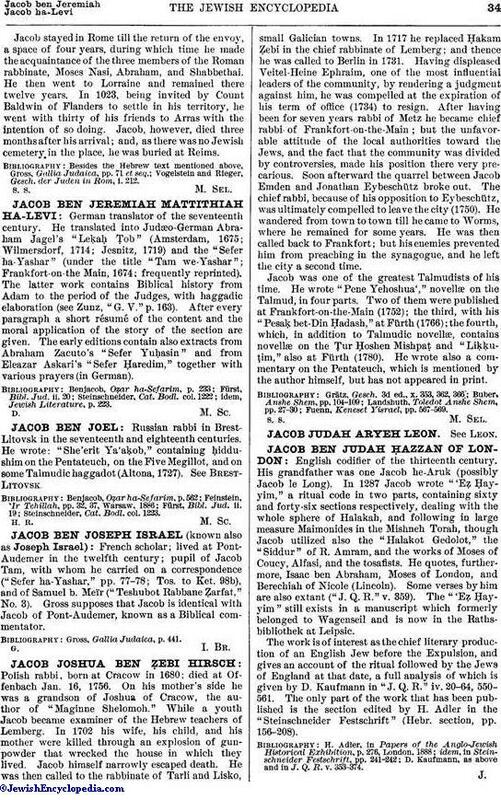 While a youth Jacob became examiner of the Hebrew teachers of Lemberg. In 1702 his wife, his child, and his mother were killed through an explosion of gunpowder that wrecked the house in which they lived. Jacob himself narrowly escaped death. He was then called to the rabbinate of Tarli and Lisko, small Galician towns. In 1717 he replaced Ḥakam Ẓebi in the chief rabbinate of Lemberg; and thence he was called to Berlin in 1731. Having displeased Veitel-Heine Ephraim, one of the most influential leaders of the community, by rendering a judgment against him, he was compelled at the expiration of his term of office (1734) to resign. After having been for seven years rabbi of Metz he became chief rabbi of Frankfort-on-the-Main; but the unfavorable attitude of the local authorities toward the Jews, and the fact that the community was divided by controversies, made his position there very precarious. Soon afterward the quarrel between Jacob Emden and Jonathan Eybeschütz broke out. The chief rabbi, because of his opposition to Eybeschütz, was ultimately compelled to leave the city (1750). He wandered from town to town till he came to Worms, where he remained for some years. He was then called back to Frankfort; but his enemies prevented him from preaching in the synagogue, and he left the city a second time. Jacob was one of the greatest Talmudists of his time. He wrote "Pene Yehoshua'," novellæ on the Talmud, in four parts. Two of them were published at Frankfort-on-the-Main (1752); the third, with his "Pesaḳ bet-Din Ḥadash," at Fürth (1766); the fourth, which, in addition to Talmudic novellæ, contains novellæ on the Ṭur Ḥoshen Mishpaṭ and "Liḳḳuṭim," also at Fürth (1780). He wrote also a commentary on the Pentateuch, which is mentioned by the author himself, but has not appeared in print. Fuenn, Keneset Yisrael, pp. 567-569.